When I was an MLIS student at the University of Illinois, I had the great honor of studying with professor Emily Knox, a respected author and expert on issues relating to intellectual freedom, censorship, and book banning. Though the first course I took under Dr. Knox did not specifically focus on these issues, throughout the semester I learned more about her work and publications and became fascinated with the prevalence of censorship throughout the world’s history and into the present moment. 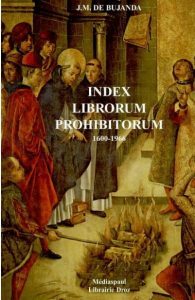 With all this in mind, when it came time to write my final paper for the course, I had zeroed in on my topic: The Catholic Church’s Index Librorum Prohibitorum, the Index of Forbidden Books that existed from around 1600 all the way until 1966. I can’t (and shouldn’t) get into the details of so many centuries in this post — for that, feel free to check out the site I created, Bibliography of the Damned. But a brief history of the Index and its many implications will hopefully suffice here. The Index Librorum Prohibitorum was a list of books banned for lay Roman Catholic readership. Officially — though the Church was never fully explicit in its means of prosecution of such rules — any individual who dared read any books included on this list risked excommunication and, thus, spiritual damnation. As mentioned above, the Index was definitively compiled Church-wide starting around 1600 and semi-regularly published in Latin (and, later, in translation) by the Vatican starting in 1632. The process of deciding which books were to be included was regulated in accordance with various canons (religious laws) regulating the Church’s official policies on printed literature. Before they were consolidated into one master serial publication, various subsets of the Church such as the Universities of Paris and Louvain and the Spanish and Portuguese Inquisitions had independently published their own indices of forbidden books throughout the sixteenth century. Finally, after almost 400 years, as a result of the reforms promulgated by the Second Vatican Council (1962-1965), the Index and its official mechanisms were officially decommissioned in 1966. Some notable authors on the Index include novelist Gustave Flaubert (Madame Bovary), historian Edward Gibbon (The History of the Decline and Fall of the Roman Empire), political intriguer and legendary lothario Casanova (his memoirs), and revolutionary astronomer Galileo (Dialogue on the Great World Systems was banned in 1634 and then removed from the Index in 1822). In addition, there are many hundreds of more obscure listings on the Index. All of the Index’s editions over the centuries were cumulatively compiled and published in 2002 by Renaissance and Catholic censorship scholar J.M. de Bujanda. The prevalence of such a large number of prolific, “household-name” thinkers and writers on this list totaling 3,000-plus authors and 5,000-plus individual titles speaks to the world-altering effects that one particular technology had during the Renaissance era: the printing press. This new machine’s capability of quickly transmitting new and potentially revolutionary ideas cannot be understated; once widespread, it posed an existential threat to the Catholic Church’s ideological and political authority over most of Europe and beyond, powers that by 1600 had been expanded and maintained for over a millennium. As any bibliophile worth their salt knows, Johann Gutenberg invented the movable-type printing press around 1450, allowing for, soon afterwards, the mass dissemination of books, pamphlets, broadsides (posters), and other printed materials. Without the printing press, for example, the “99 Theses” of Martin Luther (1517) would have to have been copied out by hand, a process that takes exponentially longer to complete than the labors of a well-staffed print shop. Simply put, neither Lutheranism nor Protestant Christianity in general may have ever spread without the printing press. As Protestantism took hold in countries such as the Netherlands and England by the 16th and 17th centuries, independent printers and publishing houses did as well. Much to the Vatican’s chagrin, published works were no longer under the control of the Catholic Church and its monasteries full of quill-pen-wielding scribes and copyists. By about 1500, the dam of information and documentation of all kinds, which we nowadays take for granted, had just begun to spring its first major leaks. The Index continues to pique my interest, even three years after writing my paper on it, for various reasons. But probably the most prominent is that it provides, somewhat ironically, an excellently well-documented registry of notable and/or notorious writings throughout the centuries since the printing press was invented. It offers a guide, as hopefully my site shows, to what caught the Vatican authorities’ attention as scandalous, unorthodox, morally repugnant, or otherwise anathema to its teachings. And though it does present a bit of an awkward case considering it was only discontinued in 1966, the underlying spirit of the Index, i.e., religious censorship, remains in some force in a few corners of Catholicism such as film criticism. As one modern Catholic writer defended in 2016, 50 years after the Index was discontinued, “Truths are like axes and hammers, tools that can be turned into weapons. The Church trusts people with the truth, though sometimes it comes with ‘This does not mean that …’ warnings. With errors, it sets off the alarm.” As seen in the quote at the top of this article, this somewhat stern caveat was indeed the intention in 1966. History and modernity are directly linked through the ways in which we obtain, process, verify, and disseminate information. A massive bibliography such as the Index (almost 1,000 pages in Bujanda’s edition) is an invaluable trove of historical information. It deserves to be studied because it offers such an expansive case of institutional censorship and intellectual freedom, issues that most certainly are still with us today. So during the next Banned Book Week, along with the many modern banned or censored titles at your disposal, consider one listed on the Index, too. There’s no shortage of great literature there. Robert M. Sarwark is a librarian at the Art Institute of Atlanta. 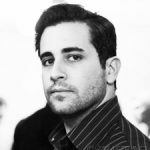 He is originally from Chicago and enjoys dogs, pizza, and writing bios in the third person. Find him on Twitter @RobSarwark. Intellectual Freedom: Where Do We Draw the Line?